Cuter Commuter: No Shower? No Problem! Tips for How NOT to Sweat While Biking to Work. No Shower? No Problem! Tips for How NOT to Sweat While Biking to Work. Audrey Hepburn staying cool and dry. You don't want to get sweaty biking to work or to get around during the day. I get it. Especially if there's not a shower facility at work or if it is not practical to shower in the middle of the day. If you shower then you would have to do your hair. Perhaps even do your makeup. Again. As if there is enough time in the work day to do all that, right? On the other hand, if you don't shower then you might feel sticky and uncomfortable. A part of you might be concerned about giving off an offensive odor all day. 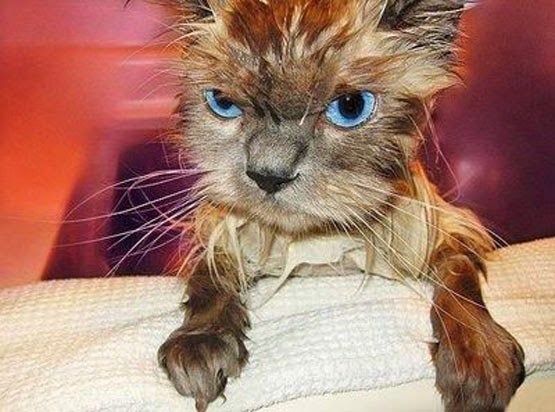 Or the worst--arriving at the office looking like a cat who just had a bath. Yeah. Not professional at all. JUST KIDDING!! Here are some (serious) tips to keep sweat at bay. Lady Fleur (who is one of THE QUEENS for riding pretty) suggests dressing in layers so you can peel off as you get warmer. I do that. 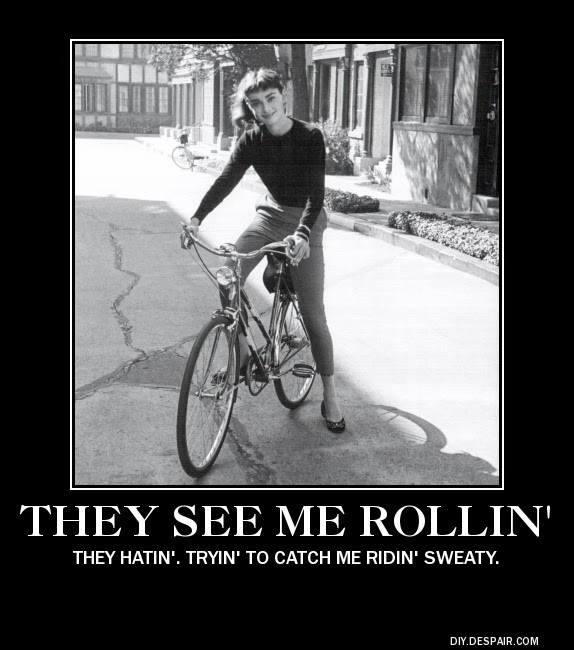 She also has many great tips in her post, The No Sweat Way to Bike to Work. Ride at easy pace to stay cool and dry. Rider slower as you get closer to your destination; slow down and cool down. Even if it takes you more time to get where you need to be. Not having to change out of sweaty clothes will save you time because you can just get off the bike and walk to where you need to be. Change a piece of clothing. If I do sweat, it is noticeably in my upper body. So sometimes I will carry my blouse or button up shirt in my pannier and an extra base layer (camisole or tank top). After I arrive at the office, I change out of the sweaty base layer and slip a fresh one on before my blouse or button up. That said, it REALLY helps to wear base layers designed for performance such as Craft, Castelli, Under Armour because the special fabric wicks away moisture to help keep you dry and neutralize odor that can surface. I am going to try Uniqlo's base layer line called AIRism. Base layers aren't just for the summer. I also wear long sleeve base layers during the winter. They're not handy just for bicycling but other outdoor sports such as skiing. Carry (or keep at the office) a small towel or handkerchief and/or wet wipes. Consider a bike (such as a Ride Scoozy) with electric assist. Use the power to help you push up that hill or to get to work faster or when you start to break a sweat in the heat. When you have a lot of miles to bike, eventually you will work up a sweat so perhaps try a combo of riding your bike and taking public transit. Mental power: how I stay dry during my 10-mile bike commute to office. 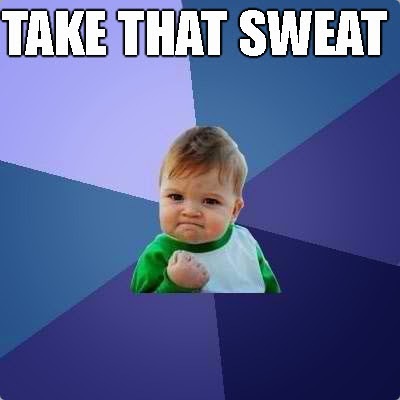 ON THE BRIGHT SIDE, SWEATING IS GOOD FOR YOU!! The light dew on your skin can help keep you cool while you are cycling. Sweating is our body's built-in mechanism for regulating its temperature by getting rid of excess heat. Sweating is like a steam sauna. It can open up your pores and keep your skin clearer of blackheads. Sweating helps purge harmful toxins from your body. It can fight infections according to an article on MSN. Sweat contains nitrite, which converts into nitric oxide upon reaching the surface, a potent gas with broad spectrum antibacterial and antifungal properties. Sweating revs up your metabolism to help you heal. Ever wonder why you sweat when running a fever? How about two-time cancer survivor kicks cancer to the curb by sweating on the bike (http://www.fitnessmagazine.com/blogs/fitstop/2014/04/04/fitness/sweat-for-good-how-you-can-kick-cancer-to-the-curb/)?! Don't believe me? Check out MSN Healthy Living, "How Sweating Is Good for Your Health" and Fitness Magazine "Sweat: 7 Reasons It Does a Body Good". When I ride my bike home, I LOVE to work up a sweat. I feel my heart thump in my chest and sometimes I gasp for air to fill my lungs and feed my muscles. I sense the dew of sweat on my forearms and nose. It tells me that I got a workout and I AM ALIVE!! And when I get home, I hop in the shower and wash that nasty little sweat away. Do you have any tips to share for how you keep sweating while biking to work to a minimum? I would like to hear from you! !